As many of you know, I communicate directly with my customers. Some would say to a fault. I don’t have a secretary or administrative assistant. My dealership’s telephone receptionist never asks the caller “who’s calling” or “may I ask the nature of your call?” and she puts my calls (and the calls to all my employees) right through. If I am not in my office, she puts them through automatically to my cell phone…7 days a week. I also have four red phones in four locations of my dealership…the showroom floor by the receptionist, the service customer waiting lounge, outdoors in the service drive, and in the body shop waiting lounge. Each phone has a picture of me with the message, “Customer Hotline To Earl Stewart. The Buck Stops Here. Have We Not Exceeded Your Expectations? Please Let Me Know. Simply Pick Up The Receiver And Wait For Me To Answer.” As if all this wasn't enough, I put my home telephone number and cell phone number on my business cards and pass them out to my new customers at our bimonthly New Owners Dinner. I was shocked to read the AP news release last week about the RL Polk study on hybrid loyalty, the measurement of how many owners buy another hybrid. My first shock was that only 25% of hybrid buyers buy another hybrid. Based on my dealership’s experience (I thought to myself) “This cannot be right!” In fact, the article was brought to my attention by a Prius customer of mine who had just bought his fourth Prius from me. My second shock was to learn that my market in Palm Beach County was the number one market in the USA for hybrid loyalty! RL Polk termed it the West Palm Beach market but that identifies the central, major city in a given market which is all of Palm Beach County. How could my market have a greater hybrid loyalty than Los Angles or Seattle? These markets are where the demographics are skewed heavily toward environmentally sensitive people, often disparagingly referred to as “tree huggers”. Now I was “sure” that this RL Polk report was wrong! I Googled the report and found it at www.HighestHybridLoyaltyInUSA.com . After studying the report, I learned that with Prius, the number one selling hybrid by a wide margin, removed from the study, the national hybrid loyalty was only 25% vs. 35%. Now I felt a little better. I knew from my dealership’s experience selling Priuses that we had a very high percentage of repeat buyers…over 75%! Finally, it all dawned on me. My dealership sells more hybrids than any other dealership in the Southeast USA and ranks very high nationally. The only dealers that outsell us are a few in California and the Pacific Northwest where, as I said, the demographics skew toward very environmentally sensitive people. Also, California and some of the other Northwestern states give special subsidies to purchasers of hybrid and all electric cars. Because we sell so many, in Palm Beach County, we moved the average from only 25% loyalty all the way up to 43%, the highest in the USA. I sell a lot of hybrids on the Internet to markets outside of Palm Beach County too. If I sold all of those in Palm Beach County, the average would have moved much higher toward 75%. So what has all of this got to do with “Being Fair to Your Customer is Not Only Right, but it’s the Fastest Path to Long Term Success”? The answer is in how I became the largest volume hybrid seller in the Southeast USA and one of the largest in the USA. Flash back to 2001 when the Toyota Prius was first imported into the USA. Toyota began selling them in Japan in 1997 and just a few were exported to the USA in 2001. My dealership received only one Prius every couple of months or so. But word had spread that the Prius was a remarkable vehicle from the experience of the first four years they were sold in Japan. Toyota could not keep up with the demand. Consequently, “everybody wanted to buy a Prius”. We had a waiting list over a year long. Other dealers do what they usually do when they have a high demand, low supply vehicle…they marked their Priuses up over MSRP by THOUSANDS of dollars. They do this by adding another sticker next to the Monroney label with a markup they sometimes call ADM for “additional dealer mark up” or MAA for “market adjustment addendum”. I refer to this as the “Phony Monroney”. Crazed customers gladly paid egregious prices to have the first Prius on their block. My dealership took, and still takes, the approach to never charge over MSRP for any vehicle, no matter how low the supply and high the demand. In fact, we wish we could sell all of our cars for MSRP because it represents a generous profit to the dealer. My customers had to wait a long time to get their Priuses back in the first few years of its introduction, but they paid a much lower price than all of the other dealers charged. We actually had customers flying in from as far away as California, buying their Prius from us and driving it back home. They saved so much that they were able to cover their airfare and a Florida vacation while they were here. Over the last eleven years, the price dealers charge for Priuses has fluctuated pretty much in direct correlation to the price of gasoline. But we have never varied from capping our price at MSRP. Now here comes the real interesting part. Auto manufacturers, including Toyota, distribute cars to their dealers based on the “turn and earn” system. This means that the faster you sell cars, the faster they ship you fresh cars to sell. The dealers marking up their Priuses thousands of dollars over sticker didn’t sell their Priuses nearly as fast as I sold mine. Because we had a waiting list during times of high demand, all Priuses that came into my dealership by truckloads were sold and delivered immediately. Consequently, I began receiving more Priuses than any other dealership in the Southeast USA and than most in the entire USA! Now you can understand what I meant by “Being Fair to Your Customer is Not Only Right, but the Fastest Path to Long Term Success”. Now, after over eleven years, I’m selling many times more Priuses and other hybrids than any other dealer in my market and more than any dealer in the Southeast USA. I’m making a smaller profit per car but I’m selling so many more that my total profit is much greater. Words and phrases like Karma, “What goes around comes around”, “Cast thy bread upon the water”, and “As ye sow so shall ye reap” come to mind. You would think that the other dealers would catch on some day, but they still haven’t. Gas is over $4.00 per gallon again and they are price-gouging their customers on Priuses just like always. More and more of their customers are coming to me and buying their hybrid at a fair price. This is why my hybrid customers are so loyal. They know their next hybrid will be priced fairly just like their last. My sales are soaring and other dealers’ are plummeting. They do make a lot more on a Prius than I do, but I make a lot more in total, and I get their customer when she’s are ready for her next Prius. Another interesting fact is that Toyota did a study when they first came out with the Prius that proved people would pay up to 20% more for a Prius than a comparable gasoline car just for the idea of driving an environmentally friendly car. They really scooped the rest of the industry on this. Nobody else figured this out until it was too late and Toyota had already captured the hybrid market. But what Toyota didn’t anticipate was the greed of their dealers. Toyota priced the Prius on the MSRP to be under that 20% limit that a customer will pay over a gasoline car, but the dealers wouldn’t listen and greed overcame logic. Toyota has no power to tell a dealer what he can charge for a car. But fortunately for me, they do reward the dealer who sell their cars fastest and that’s how I came to be #1 in hybrid sales in the Southeast USA with the highest hybrid customer loyalty in the USA. Regular readers may wonder what newspaper ethics have to do with cars, which are what I write about. The answer is that car dealers are the biggest advertisers in most local newspapers. In fact, in the last ten or twenty years, they have grown to become the largest, maybe second to real estate. Without car dealers’ ads, most local newspapers could not exist. One notable exception is Hometown News which publishes this column weekly. The reason you don’t see more newspaper ads in Hometown News is because of my column and for this, I salute Steve Erlanger, the publisher. He has the courage and ethics to allow me to write the truth in spite of the fact that it costs him advertising revenue. This is not the first fight I’ve had with the Palm Beach Post. I wrote “Journalistic Ethics in Car Advertising” for my blog and Hometown News two years ago. And I wrote “Never Having to Say you’re Sorry if you’re the Palm Beach Post” just a couple of months ago. I don’t know if feel more anger about the erosion of journalistic ethics in newspapers or more pity. Self Preservation is our strongest, most basic instinct. Advertising revenues are the lifeblood of newspapers and ad dollars have dried up to the point where most local daily newspapers are hanging by a thread. This newspaper ad revenue draught started with Television and the Internet was the coup de grace. If I and my family were starving and I had no other choice, I might resort to less than ethical means to provide us food. However, it’s one thing to print unfair, deceptive and even illegal ads for car dealers in your newspaper because you rely on them for ad revenue. It’s an entirely different thing to attack the good, ethical, and honest sheriff of Palm Beach County and imply that he’s stealing money from the taxpayers to buy lunches for himself and political supporters. 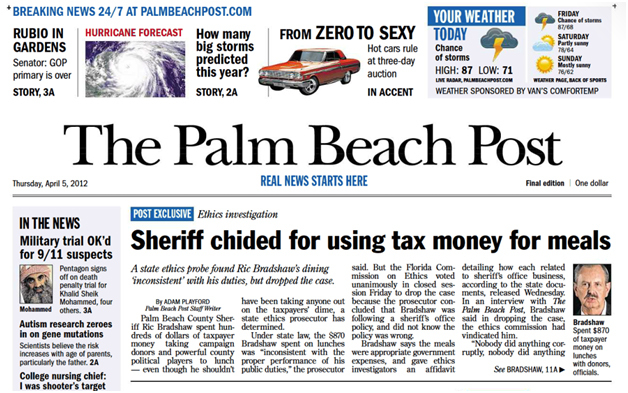 Below you will see the headline from the Palm Beach Post of April 5, 2012. Below that is my letter to the editor which was published April 9, 2012. The highlighted parts are portions of my letter that the PB Post chose to redact. The most important message I wanted to send with my letter is that it’s easy for the PB Post to attack a good man like Sheriff Ric Bradshaw. After all he’s a Republican and a public figure. Most of the Post’s readers will applaud this attack because they side with the PB Post politically and because they read only the headlines. Ric Bradshaw knows that a public figure has little chance of winning a libel suit against a newspaper and a lawsuit would just draw more attention to the accusations. That’s why you never see an attack like this on a large advertiser in their paper. A car dealer can fight back by, not only suing for libel, but stopping his advertising. I wrote another blog article several years ago after having the honor and privilege to have lunch with Bob Woodward of the Washington Post and Watergate fame. The article is entitled, “A Conversation with Bob Woodward about Integrity in the Media”. Bob Woodward told me that he believed that the greatest threat to the future of the USA and the world was that “the media is failing to fulfill its vital role to report all of the news fearlessly, completely, honestly, and ethically”. 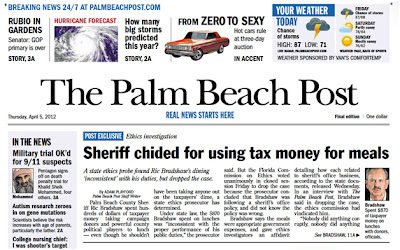 If the PB Post wants to express its opinion that Sheriff Ric Bradshaw is untrustworthy and not fit for his elected position, say it in your Opinion section, not a front page, headline news article as you did Thursday, April 5..."Post Exclusive"; Ethics Investigation; SHERIFF CHIDED FOR USING TAX MONEY FOR MEALS. You covered yourself quite well for those few who read long newspaper articles completely to their conclusion. You ultimately disclosed that Sheriff Bradshaw had done absolutely nothing wrong! In fact, what he had done was commendable. So why is this headline on the front page? The answer, of course, is that you know people scan newspapers and read headlines and it’s that first impression that gets your message across. Would the PB Post write a headline story, "TIM BURKE ACCUSED OF CHILD MOLESTATION”, if he was so accused by a disgruntled ex-employee (of which the PB Post has many)and there was no other evidence? One last thing, what purpose did you have for digging up the fact that John Staluppi, who Sheriff Bradshaw took to lunch, "was 'accused' decades ago of mob ties"? John Staluppi is a very successful businessman and philanthropist who provides thousands of jobs and donates millions of dollars to worthy causes. Since when is being "accused" something to be ashamed of? I'm beginning to believe that the only way a South Florida resident can protect her or himself from a character attack by the PB Post is to be a large advertiser. From the looks of your plummeting advertising revenues, this will soon leave most of us without protection. This blog post originally ran five years ago. It’s important that I run it again today because violation of this Federal law, especially its intent, which is to inform car buyers of the official retail price suggested by the car manufacturer, is rampant by most car dealers. The US Senator who drafted this law, Mike Maroney, said this about his law, “The dealer who is honest about the so-called ‘list price’ cannot compete with the one who ‘packs’ several hundred dollars extra into it so he can pretend to give you more on the trade-in.” Senator Monroney said this in 1958 and the only thing that has changed is that dishonest dealers are now charging several thousand dollars extra. As I write this, the national average price of a gallon of gas is over $4 and climbing. Car dealers are marking up fuel efficient cars, especially, hybrids by thousands of dollars. They add their dealer window sticker, identical in style to the Monroney label right next to it so that it’s virtually indistinguishable. Then, to add insult to injury, they remove the both labels before delivery which is illegal. “Phony Monroney” should not be confused with “Boney Maroney” (I got a gal named Boney Maroney. She’s as skinny as a stick of macaroni). That song was first recorded by Larry Williams during my high school years, 1956-1958. You will appreciate this lame attempt at humor only if you are about my age, 66. When customers confuse the phony Monroney with the real one, this distorts their point of reference for comparing prices between different dealerships. One manufacturer’s Monroney labels are consistent. A 2007 Honda Accord with the same factory accessories will have the same MSRP at every Honda dealership you visit. But if dealers fool you into thinking their label is part of the Monroney, you are not comparing “apples and apples”. This can adversely affect a good buying decision in a number of ways. Some buyers focus mainly on how big a trade-in allowance they can get for their old car. If one dealer has the same car marked up $3,000 more than another dealer, he can offer you $3,000 more for your trade and still make the same profit as the other dealer. Some buyers focus on how big a discount they get from “sticker”. It’s easy to give a higher discount if you have artificially inflated the MSRP by thousands of dollars.